Visiting the International Institute of Culinary Arts Le Cordon Bleu São Paulo and watching closely the chefs working in the kitchen is the dream of many gastronomy fans. And that was the experience lived by 47 participants of the Open Doors held this Saturday, 4th August. 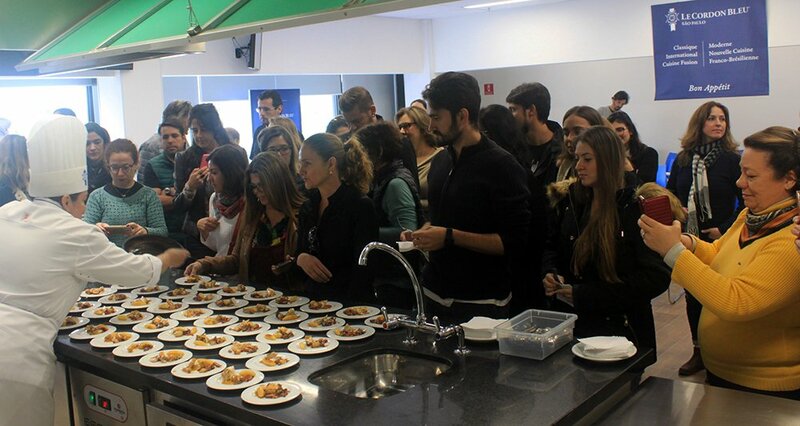 During the event, visitors were able to get to know the kitchens that are part of the Institute's facilities and to know more details about the diplomas offered: Grand Diplôme, Diplôme de Cuisine and Diplôme de Pâtisserie, in addition to Basic, Intermediate and Superior certificates in Cuisine and Pâtisserie. The most awaited moment for the participants is the demonstration class, when the chefs give a pinch of the day to day of the students in the classrooms. This Saturday, the recipe chosen was the Poulet Grand Mère, which consists of a dish made with chicken, potatoes, Paris mushrooms, bacon and onions. The dessert produced was a classic of German cuisine, the Black Forest cake (Forêt Noire). The novelty of the Open Doors of this Saturday is that the internet users could watch the broadcast live in the stories of Instagram, a success! The next Open Doors will be held on 18th August. Register now and get to know Le Cordon Bleu São Paulo. Le Cordon Bleu São Paulo has as its technical academic director the chef Patrick Martin; chef Jean Yves, who runs Cuisine courses; chef Amanda Lopes, ahead of Pâtisserie; and chef Renata Braune, in the preparation and production. Next Open Doors: 18th August. Register now.